First, a message from my 17-year-old self: Oh, my God! Oh, my God! I was in the same room as Orlando Bloom! Breathing the same air! Oh, my God! I saw him act in person! Ahhhh! Back to being 27 years old: As you can probably guess from the giant photo of a poster above, Orlando Bloom, he of elves and pirates, he of the endless (literally) volume(s) of fanfiction I produced from ages 17 to 19, is making his Broadway debut in Romeo and Julietas, well, Romeo. What's the last juicy bit of gossip you heard? Somewhere along the way, gossip has become a theme in my WIP. I knew it was there and I knew it was an important theme because of the story--new neighbor moves into small English village. New neighbor has two kids of obviously different racial origins. New neighbor lives in 1800. Commence gossiping! But then the gossip element took on its own life--one of the best things about novel writing--and it is a huge part of the climax and denouement, even if I think the ending is still a bit rushed. You know you wanted part two of the Gloriously Awkward Sentences. I have finally finished this pass of editing (I'm not too happy with the last five chapters in that everything feels rushed, so I'll be bucking those up). In the meantime, take a look at more weird sentences, likely typed at 4 am. Past her, on the blanket, the four little girls stood. A prime example of Queens grammar if ever there was one. Notice the backwards construction. This post stems from a conversation with two friends, Beta and Shar-Shar. I was, as usual, updating them on the progress of Le Novel. They're not very good blog readers, my friends. Anyway, I was telling Beta about some of the new elements in the book since she read the finished second draft. She seemed satisfied that I was following her advice lol. I told them how the antagonist, Mrs. Hamilton, is sort of based on several managers at work who get on my nerves. But actually, that's not entirely true. She is really based--in fact, her name comes from--this awful science teacher I had in junior high who didn't really teach, had arbitrary rules, and then made me stand in front of the class for three days presenting a science fair experiment, by the end of which I was in tears. It's okay; I'm over it. (She says gleefully). I am editing my manuscript right now. 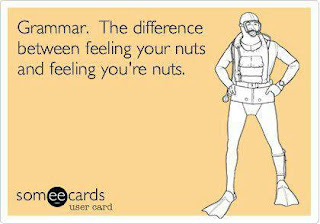 Instead of endless rewrites, I'm reading through it in its entirety and making corrections--spelling, grammar, word choice, deleting repetitive phrases, deleting unnecessary adverbs, passive voice into active voice. Little nitpicky line editing things. 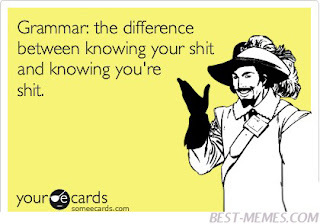 I often feel that my grammar is on shaky ground. As I've ranted about before, my high school English classes were almost exclusively about dissecting literature, always more about the New York State Regents Tedious Torture Exam. One of these days, I'll tell you about the Semester of Infidelity in 11th grade. We learned verbs, nouns, adjectives, adverbs, punctuation, predicates, and subject in elementary school, but a great deal of English grammar has come to me through osmosis--hearing other people speak, reading others' words. 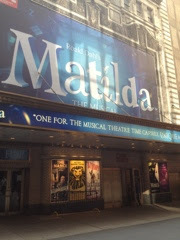 I went to see Matilda the Musical at the Shubert Theatre last night. It was about as magical as I thought it would be. 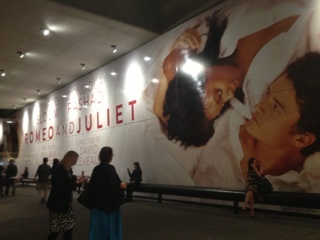 Beta and I went in excited to see it and came out loving the show, quoting lyrics and lines to each other ("Maggots." 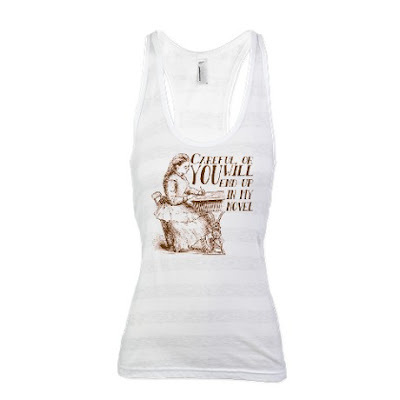 "Hey boy!" "I'm a girl!" "My mummy says I'm a miracle." "Ian McEwan/ Ugh, I feel like spewin'"). So much of the story is about storytelling, reading and the power of imagination that it's pretty perfect for a writer in editing mode to see. Because stories are magic. Plus, since Beta and I both enjoy the anarchic songs of Tim Minchin, the composer, who is also a songwriter/piano player/comedian, we appreciated the wordplay in the lyrics. Seriously--wonderful performances. Four girls alternate the role of Matilda. Our Matilda was Bailey Ryon. I've gotten through editing chapter one. It's mostly trimming sentences or replacing boring verbs with better ones or clarifying or realizing that I've used the same word twice in same sentence. Truth is, I wonder if it's too front-loaded---if there's actually too much going in the first ten pages or so that it might confuse readers. I'll worry about that on the next pass, I think. Instead of printing out the manuscript or immediately handing it over to a beta reader, I uploaded the document onto my Kindle. 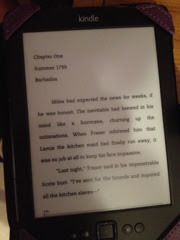 It's not quite as well-formated as a real e-book would be, but I find that the Kindle is great for reading--no urge to fiddle with my story every ten minutes. I seem to be on a mini WWI kick lately, after finishing Birdsong. I don't remember covering the Somme in any great detail in school-- I guess because the Americans hadn't entered the war yet? Anyway, after seeing part of it depicted on Downton Abbey, reading about it in Birdsong and seeing it portrayed in the miniseries, I started flicking through the Kindle store to see if I could find anything about the Somme. One of the things about finishing a draft is that you get to read other people's books again and not just for research.